Service out of Tradition. Your Taxi in Bad Honnef. Nennen Sie uns bei der Anmeldung bitte Ihren Namen, Ihr Fahrtziel, die Anzahl Ihrer Begleiter, die gewünschte Abfahrtzeit und die Abfahrtstelle. Wenn Sie großes Gepäck, das einen Sitzplatz belegt, mitnehmen wollen, teilen Sie uns dies bitte ebenfalls mit. Gehen Sie bitte rechtzeitig zur Abfahrtstelle. Gelegentlich kann sich die Abfahrtzeit um wenige Minuten verzögern (wenn für eine Fahrt mehrere Anmeldungen eingegangen sind). Vor Antritt der Fahrt verkauft Ihnen der Taxifahrer Ihre AST-Fahrkarte. AST-Fahrkarten sind nicht übertragbar und berechtigen nur zu einer Fahrt. Fahrtunterbrechungen sind nicht möglich. Tiere werden im AST-Verkehr nicht befördert. Ausgenommen sind Führhunde in Begleitung der anspruchsberechtigten Personen (Sehbehinderte, Blinde). Wenn Sie als erster Fahrgast einsteigen, achten Sie bitte darauf, dass der Taxameter erst bei der Abfahrt eingeschaltet wird. Steigen Sie als letzter aus, dann quittieren Sie bitte dem AST-Fahrer die Anzahl der beförderten Personen und den Endstand des Taxameters bzw. Wegstreckenzählers. Leisten Sie in keinem Fall eine Blankounterschrift! In der Silvesternacht endet der AST-Betrieb um 23 Uhr. Bei Großveranstaltungen kann es zu Verzögerungen kommen. Bitte bestellen Sie Ihre Fahrt rechtzeitig vor. Our services are available 24/7, 365 days a year. Call us at 0049 2224 2222. Apart from our passenger accommodation services we also offer to plan and organize your visit to Bad Honnef. Let us plan your stay and organize your activities. Are you looking for a hotel room? Do you want someone familar with the localities to organize your visit? We organize accomodation, restaurant visits and plan outdoor activities like hiking tours or excursions to local places of interest. For example visits to castle Burg Linz, the Bridge of Remagen, etc. Click here to find out more about Bad Honnef. The company was founded in 1963 by Wilhelm "Män" Trommeschläger, the father of today's owner Mrs. Monika Sieg. 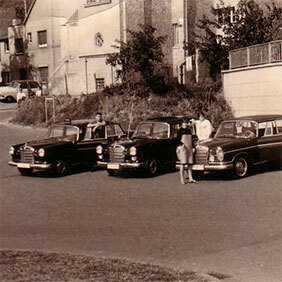 It's the oldest family run taxi company in Bad Honnef today. It all began with just a few regular customers and developed to the modern service orientated corporation it is today. 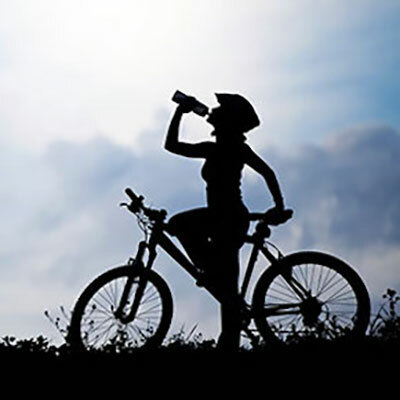 We have a solid base of contempt and loyal customers both in Bad Honnef as well as in the neighboring cities and we're the choice of many local hotels and restaurants. We're looking forward to answer your call. Unser vehicle fleet consists of high standard limousines und vans. You will find the classic E-Class Mercedes Taxi and even neutral Limousines for special business occasions. All our Vehicles are Top-brand limousines and Vans. We don't compromise when it comes to comfort or safety. All modern, air-conditioned and non-smoking vehicles. For local transport as well as for long distance trips. We also offer Chauffeur Services in neutral Mercedes Limousines. Whatever occasion: We have the right vehicle for you! We are always looking for reinforcements for our team. We are looking for friendly, reliable drivers who are familiar with Bad Honnef and it's surroundings. We are a service orientated business and our customers are our capital. Friendliness and Helpfulness are the basics of our genre. We also require responsible handling of our cars as well as the ability to be able to work as a team. Language skills: Fluent in German. Basic English skills are a plus. If you need help obtaining your passenger transportation license, let us know. In some cases we might even pay the license fees. Basically we have Day- and Nightshifts. But individual working hours are also possible. If you are interested call us: 02224 2222 or use our Contact Form. For further information please refer to the resource: Informationen zum Personenbeförderungsschein finden Sie hier. Bad Honnef is a spa town in Germany near Bonn in the Rhein-Sieg district, North Rhine-Westphalia. It is located on the border of the neighbouring state Rhineland-Palatinate. To the north it lies on the slopes of the Drachenfels (“Dragons's Rock”) mountain, part of the Siebengebirge. Bad Honnef is home to a mineral spring called the Drachenquelle ("Dragon Spring") which was discovered in 1897. This discovery led to Honnef, as the town was called at the time, transforming from a wine-growing town to a spa town, adding the prefix Bad to its name. The mineral spring has been used for both drinking and bathing. The villages of Aegidienberg, Selhof and Rhöndorf are considered to be part of Bad Honnef. During his term as first chancellor of Germany, Konrad Adenauer lived (and died) in Bad Honnef, as it was near Bonn, then the capital of the Federal Republic of Germany. Also, German politician and leader of the Free Democratic Party Guido Westerwelle was born in Bad Honnef. Since the 1980s Bad Honnef has developed into an important place for conferences in Germany. Because of the close proximity to the still internationally important Federal City of Bonn, many federal institutions are located in Bad Honnef. Information about Tourism around the "Siebengebirge"
Information about hiking alon the "Rheinsteig"
We will confirm your order as soon as possible. All links to outsie resources were checked carefully at the time they were added. But we are in no way responsible for, or have control of, the content of any external web site you might find linked on our website. We are very delighted that you have shown interest in our enterprise. Data protection is of a particularly high priority for the management of Taxi Trommeschläger. The use of the Internet pages of Taxi Trommeschläger is possible without any indication of personal data; however, if a data subject wants to use special enterprise services via our website, processing of personal data could become necessary. If the processing of personal data is necessary and there is no statutory basis for such processing, we generally obtain consent from the data subject. 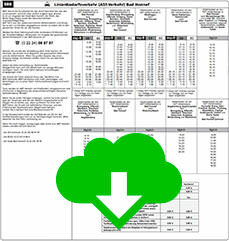 The processing of personal data, such as the name, address, e-mail address, or telephone number of a data subject shall always be in line with the General Data Protection Regulation (GDPR), and in accordance with the country-specific data protection regulations applicable to Taxi Trommeschläger. By means of this data protection declaration, our enterprise would like to inform the general public of the nature, scope, and purpose of the personal data we collect, use and process. Furthermore, data subjects are informed, by means of this data protection declaration, of the rights to which they are entitled. As the controller, Taxi Trommeschläger has implemented numerous technical and organizational measures to ensure the most complete protection of personal data processed through this website. However, Internet-based data transmissions may in principle have security gaps, so absolute protection may not be guaranteed. For this reason, every data subject is free to transfer personal data to us via alternative means, e.g. by telephone. The data protection declaration of Taxi Trommeschläger is based on the terms used by the European legislator for the adoption of the General Data Protection Regulation (GDPR). Our data protection declaration should be legible and understandable for the general public, as well as our customers and business partners. To ensure this, we would like to first explain the terminology used. The website of Taxi Trommeschläger collects a series of general data and information when a data subject or automated system calls up the website. This general data and information are stored in the server log files. Collected may be (1) the browser types and versions used, (2) the operating system used by the accessing system, (3) the website from which an accessing system reaches our website (so-called referrers), (4) the sub-websites, (5) the date and time of access to the Internet site, (6) an Internet protocol address (IP address), (7) the Internet service provider of the accessing system, and (8) any other similar data and information that may be used in the event of attacks on our information technology systems. 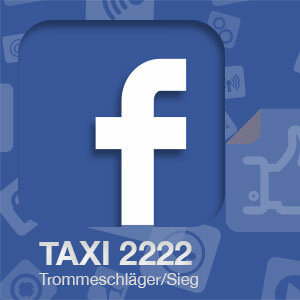 When using these general data and information, Taxi Trommeschläger does not draw any conclusions about the data subject. Rather, this information is needed to (1) deliver the content of our website correctly, (2) optimize the content of our website as well as its advertisement, (3) ensure the long-term viability of our information technology systems and website technology, and (4) provide law enforcement authorities with the information necessary for criminal prosecution in case of a cyber-attack. Therefore, Taxi Trommeschläger analyzes anonymously collected data and information statistically, with the aim of increasing the data protection and data security of our enterprise, and to ensure an optimal level of protection for the personal data we process. The anonymous data of the server log files are stored separately from all personal data provided by a data subject. The website of Taxi Trommeschläger contains information that enables a quick electronic contact to our enterprise, as well as direct communication with us, which also includes a general address of the so-called electronic mail (e-mail address). If a data subject contacts the controller by e-mail or via a contact form, the personal data transmitted by the data subject are automatically stored. Such personal data transmitted on a voluntary basis by a data subject to the data controller are stored for the purpose of processing or contacting the data subject. There is no transfer of this personal data to third parties. If one of the aforementioned reasons applies, and a data subject wishes to request the erasure of personal data stored by Taxi Trommeschläger, he or she may, at any time, contact any employee of the controller. An employee of Taxi Trommeschläger shall promptly ensure that the erasure request is complied with immediately. Where the controller has made personal data public and is obliged pursuant to Article 17(1) to erase the personal data, the controller, taking account of available technology and the cost of implementation, shall take reasonable steps, including technical measures, to inform other controllers processing the personal data that the data subject has requested erasure by such controllers of any links to, or copy or replication of, those personal data, as far as processing is not required. 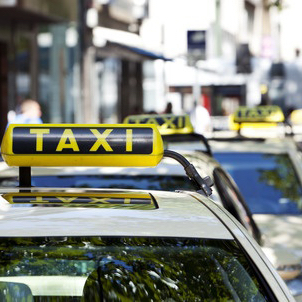 An employees of Taxi Trommeschläger will arrange the necessary measures in individual cases. If one of the aforementioned conditions is met, and a data subject wishes to request the restriction of the processing of personal data stored by Taxi Trommeschläger, he or she may at any time contact any employee of the controller. The employee of Taxi Trommeschläger will arrange the restriction of the processing. In order to assert the right to data portability, the data subject may at any time contact any employee of Taxi Trommeschläger. Taxi Trommeschläger shall no longer process the personal data in the event of the objection, unless we can demonstrate compelling legitimate grounds for the processing which override the interests, rights and freedoms of the data subject, or for the establishment, exercise or defence of legal claims. If Taxi Trommeschläger processes personal data for direct marketing purposes, the data subject shall have the right to object at any time to processing of personal data concerning him or her for such marketing. This applies to profiling to the extent that it is related to such direct marketing. If the data subject objects to Taxi Trommeschläger to the processing for direct marketing purposes, Taxi Trommeschläger will no longer process the personal data for these purposes. In addition, the data subject has the right, on grounds relating to his or her particular situation, to object to processing of personal data concerning him or her by Taxi Trommeschläger for scientific or historical research purposes, or for statistical purposes pursuant to Article 89(1) of the GDPR, unless the processing is necessary for the performance of a task carried out for reasons of public interest. In order to exercise the right to object, the data subject may contact any employee of Taxi Trommeschläger. In addition, the data subject is free in the context of the use of information society services, and notwithstanding Directive 2002/58/EC, to use his or her right to object by automated means using technical specifications. If the decision (1) is necessary for entering into, or the performance of, a contract between the data subject and a data controller, or (2) it is based on the data subject's explicit consent, Taxi Trommeschläger shall implement suitable measures to safeguard the data subject's rights and freedoms and legitimate interests, at least the right to obtain human intervention on the part of the controller, to express his or her point of view and contest the decision. If the data subject wishes to exercise the rights concerning automated individual decision-making, he or she may, at any time, contact any employee of Taxi Trommeschläger. If the data subject wishes to exercise the right to withdraw the consent, he or she may, at any time, contact any employee of Taxi Trommeschläger.